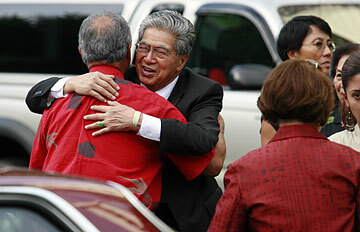 U.S. Sen. Daniel Akaka was met yesterday evening by state Sen. Robert Bunda as he arrived at a memorial service for Maggie Inouye, the late wife of U.S. Sen. Daniel Inouye, at Harris United Methodist Church. MORE THAN 1,000 people gathered last night in the church where Maggie and Dan Inouye were married to remember the woman who set aside her own promising career to support Hawaii's senior senator when he was just a young Army veteran with big dreams. "For Dan, to lose Maggie means to lose a very precious part of himself," said the Rev. Nobuku Miyake-Stoner, who presided over yesterday's hour-long service at Harris United Methodist Church on Vineyard Boulevard. "She was a quiet leader -- the leader behind the leader. She believed in Dan from the time she first met him." 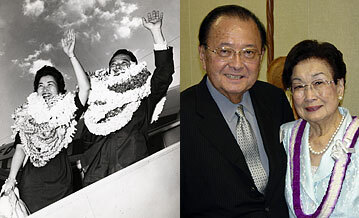 U.S. Sen. Daniel Inouye and his wife, Maggie, shown above in 1959 and 2004, were married in June 1949. Inouye, a Roosevelt High School graduate who friends say learned to charm dignitaries in Washington, D.C., but never forgot her roots in the islands, died on March 13 at the age of 81 at Walter Reed Army Medical Center after a long battle with colon cancer. She will be buried at the National Memorial Cemetery of the Pacific. Services at the church started at about 5:30 p.m. after hundreds of attendees offered their condolences to U.S. Sen. Inouye and his son, Kenny. Gov. Linda Lingle, the state's congressional delegation, two former Hawaii governors and several state lawmakers were among the attendees. Maggie Inouye's longtime friend Sumi McCabe delivered the eulogy. She recalled how she met Inouye when they were teachers-in-training at Central Intermediate School, and watched her calm classes of troublemakers with little more than a look and a "tssk!" The two later worked together as lecturers at the University of Hawaii, McCabe said. "When Dan called and asked me to prepare a eulogy for Maggie, I said yes, because there is nothing in the world I wouldn't do for Maggie," McCabe said. "But then, the weight of the task hit me. Maggie was a very complex woman. She was my closest friend. She was my inspiration, my role model for 50 years." Addressing the packed pews along with hundreds seated outside the church's hall on take-down chairs, McCabe said Inouye was modest and quiet but would never hesitate to defend a friend "like a mother hen." Mourners lined the Harris United Methodist Church courtyard yesterday to pay their respects at a service for Maggie Inouye, the late wife of U.S. Sen. Daniel Inouye. "For Dan, to lose Maggie means to lose a very precious part of himself," said the Rev. Nobuku Miyake-Stoner. "To me she was flawless," McCabe said. "She wants us to remember her as a caring mother, a devoted wife. She would want us to take solace in the fact that we'll see her again, somewhere, sometime." For the service, a black-and-white photo of Inouye was placed upright on a table at the head of the chapel and surrounded by leis. Many attendees slowly bowed their heads to the photo as they passed or paused in front of it to pay their respects. As Kenny Inouye went up to the podium to deliver the closing address, he stopped at the photo to place a kiss on his mother's forehead. "One of the last things I said to my mother at her bedside," he told attendees, "was that 'because of you, I am who I am today.' I spent a lot of time with my mother. But after they pass, you always want a few more minutes." 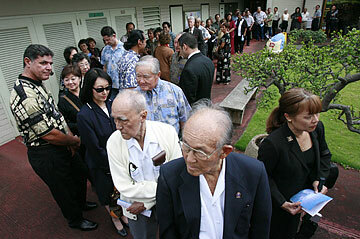 Inouye also thanked islanders for their outpouring of support following his mother's death. The family has received thousands of letters and e-mails of condolence. Sen. Inouye did not speak at the service, but occasionally dabbed his cheeks with a tissue given to him by his son. During a prayer given by Miyake-Stoner, Inouye closed his eyes and looked up toward the sky. Maggie Inouye is also survived by sisters Edith Satow of Camarillo, Calif.; Grace Murakami of Honolulu; Betty Higashino of Orinda, Calif.; Shirley Nozoe of Honolulu; and Patricia Tyler of Sudbury, Mass.